Welcome to Tasty Tuesday. I know it has been a long time since I have added a recipe. Trust me, we have still been eating. The last couple of weeks, I have been finding myself with a dilemma. The dilemma has been the UNPLANNED food item coming home with my husband. It is a good dilemma to have for many reasons. One of those reasons has been to expand trust my culinary skills of 30+ years, in which I have turned into a “what can I make with this challenge”. Today’s recipe did not derive from unplanned food, but from the need of a dessert. The cake recipe I wanted to make called for pineapple, however one of the guest is allergic to pineapple. Ugh, I can hear that voice in my head saying “Just make something else!” But I don’t want something else, so for days the thought of this recipe stayed in the back of my head. An idea was born, a new recipe was created and without further delay. I am sharing it with you now….. Mix as directed on package, pour into a greased 13 x 9 inch sheet pan. Bake at 375° For 20 to 25 minutes. Cool completely. Adjusted the called amount of water with the strawberry juice. Example my mix called for 1 cup of water, I poured the strawberry juice into the measuring cup and then added enough water to equal 1 cup. Crush strawberries as though you were making a salsa or topping for strawberry shortcake, add 1 tablespoon of sugar. Drain completely. Mix cream cheese until it is creamy. Add pudding mix and milk. 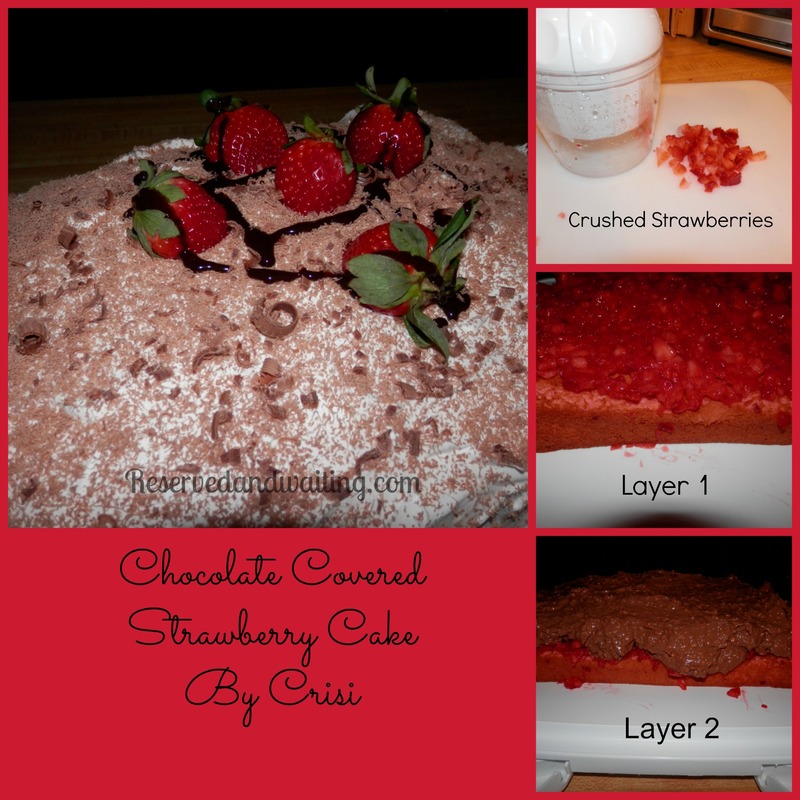 Spread over the strawberry covered cake. Spread an extra-large container of Cool Whip onto the cake. 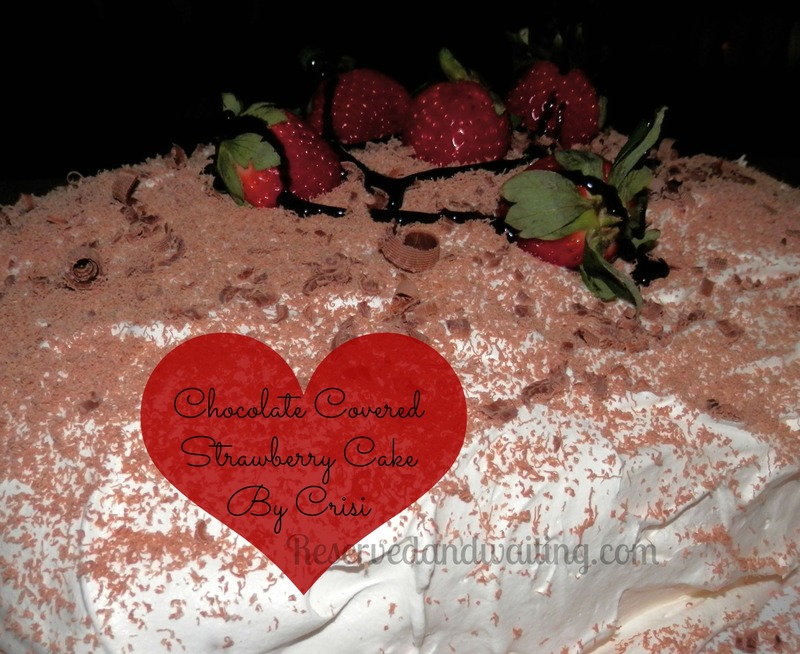 Garnish with the 4 leftover strawberries and grated chocolate. Looks yummy, and sounds easy. My kind of baking! 🙂 Pinning for later!